Representative Adam Clayton Powell Jr. was seated by Congress after being excluded in 1967. Australian media baron Rupert Murdoch purchased the largest-selling British Sunday newspaper, The News of the World, and would go on to expand his media empire in the United States. John Lennon’s “2 Virgins” album was declared pornographic in New Jersey. Marvin Gaye’s “I Heard It Through the Grapevine” was the most popular song among listeners in the United States. The future King of England Prince Charles joined the Cambridge Footlights and tread the boards as an actor along with many famous actors who got their start in that club, but alas, his future lay elsewhere. Baseball legend Mickey Mantle hit his final career home run, number 536. President Richard Nixon appeared on the “Rowan & Martin Laugh-In” show offering the program’s signature, “Sock it to me” as his one liner. In the United States, people were listening to “Harper Valley P.T.A.” by Jeannie Riley. “The Case Against Congress” by Drew Pearson and Jack Anderson was among the best selling books of its time. Robert F. Kennedy announced he would seek the Democratic nomination for president. The Beatles released “Lady Madonna” in the United Kingdom. The My Lai massacre, one of the most controversial actions of the Vietnam War, resulted in U.S. soldiers killing 400 unarmed Vietnamese civilians. The U.S. Mint stopped buying and selling gold as Congress repealed the requirement for a gold reserve to back the country’s currency. A former Shelter Island town justice and her husband pleaded guilty November 15 to different charges to end their embezzlement trial in Riverhead. Prosecutors alleged that the couple stole more than $1 million over a four-year period from an elderly Water Mill woman who suffered from dementia. According to Suffolk County District Attorney spokesman Bob Clifford, Katherine Pope pleaded guilty to fourth-degree identity theft, a misdemeanor, and her husband, Wayne, pleaded guilty to fourth-degree grand larceny, a felony. They’ll be sentenced by Judge Stephen Braslow on January 10. The couple was indicted in August 2009, one month after the victim, Mary Abbott Estabrook, died at the age of 89. Ms. Pope was no longer on the bench at the time. Mr. Pope allegedly obtained power of attorney from the victim while he worked as a handyman in her home and wrote checks to benefit himself, according to the DA’s office. Ms. Pope, who served as a town justice on Shelter Island from 1998 to 2002, was initially charged with first-degree grand larceny and two counts of first-degree identity theft. The ID theft charges are related to telephone transactions made in 2006, when Ms. Pope allegedly identified herself as Ms. Estabrook and liquidated more than 12,000 shares of stock, according to the prosecution. A former Shelter Island town justice and her husband pleaded guilty Nov. 15 to different charges to end their embezzlement trial in Riverhead. According to Suffolk County District Attorney spokesman Bob Clifford, Katherine Pope pleaded guilty to fourth-degree identity theft, a misdemeanor, and her husband, Wayne, pleaded guilty to fourth-degree grand larceny, a felony. They’ll both be sentenced by Judge Stephen Braslow on January 10. The couple was indicted in August 2009, one month after the victim, Mary Abbott Estabrook, died at the age of 89. Ms. Pope was no longer on the bench at the time. 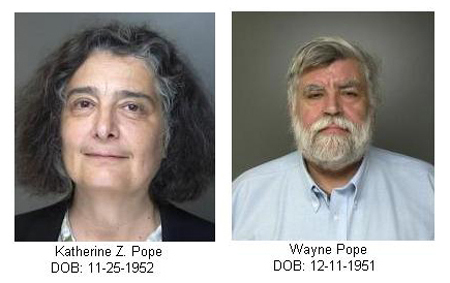 Mr. Pope allegedly obtained power of attorney from the victim while he worked as a handyman in her home. He then wrote checks to benefit himself, according to the DA’s office. Mr. Clifford said Ms. Pope’s other charges are considered “covered by the plea,” meaning her sentence won’t include them but they’ll remain on her criminal record. The Shelter Island Town Board appointed Ms. Pope, a Democrat, in 1998 to fill a positions in Justice Court that had been left vacant by the death of Judge Howard Cronin. That November, she ran against Garth Griffin and was elected to serve out Judge Cronin’s four-year term. She ran for re-election in 2002 and was defeated by Republican William A. Sulahian.